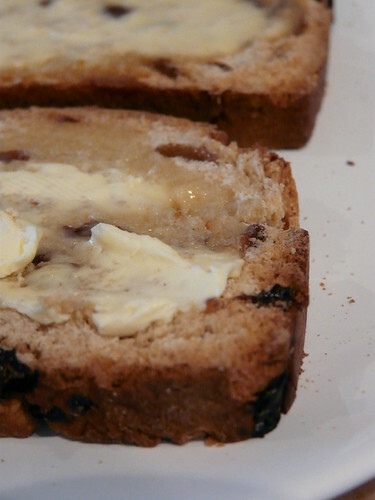 Mention “malt loaf” to a Brit and they will generally think of Soreen. Dense, dark and fudgy, Soreen is the kind of cake my nana used to have in her bread tin to eat alongside her afternoon coffee. It’s good stuff but it’s nothing like the tea-bread I’ve been making recently. Lighter, less chewy and less treacley, my own version of the malt loaf is more like a fruit-loaf but with a very distinctive malted flavour. It’s lovely sliced with some strawberry jam but is spectacular toasted and smeared generously with butter. Whisk together the yeast, sugar and water in a large bowl. Cover and set aside in a warm place for 15 minutes. Meanwhile melt the butter in a small pan over a low heat along with the maple sugar, malt extract and salt. Do not boil. Remove liquid from the heat once the butter has melted and combined with the syrups. Sift the flour into the yeast liquid. Add the sultanas and contents of the pan. Stir with a wooden spoon to combine and create a dough. Remove dough from the bowl and knead on a floured surface for a good 5 minutes. You may need to add a little extra water if dough is too tough. Shape dough into a loaf shape and place in a buttered 1kg loaf tin. Cover with a clean tea towel and leave in a warm place for 4 – 6 hours or until the dough has risen to the top of the pan or doubled in size. Bake in a 180 oC oven for 45 minutes. Remove from pan and cool thoroughly before slicing and enjoying. Scrumptious. I am not a big fan of raisins or sultanas (I am trying though) – have you ever tried this with any other dried fruit? Apricots? Cherries? I will happily confess to a massive love of Soreen as a kid. But this looks the business, too, especially if it – like Soreen – can take generous slatherings of butter. Bring it on! Your pictures are always TOO good – I wanted to reach into the computer and pick up that buttered slice!! This looks delicious. I’m off to the market today and I think I’ll grab some malt extract to make this! No raisins or fruit in my bread, thank you – brr, one of my pet peeves – but fresh out of the oven homemadebread with butter and perhaps a bit of cheese… oh that’s bliss! You know, I’ve never tried baking bread with malt syrup before. I think it must be a very UK ingredient to use. I love sultans in bread and maple syrup is always a welcomed addition to just about any recipe. 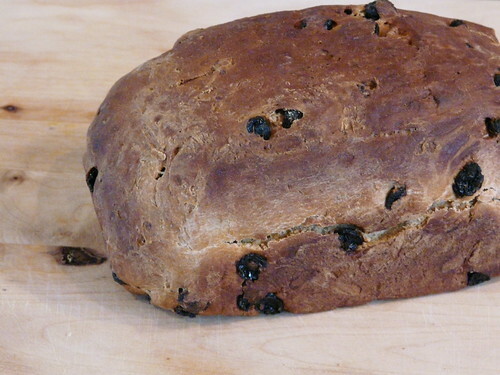 Yum, I made a tea loaf a while back to use up some dried fruit I had lying around, but didn’t put any malt in it. I totally love Soreen though, so the maltiness of that plus the deliciousness of home made tea bread has to be worth a try! That loaf looks great Wendy! I bet the smell of it wafting around the house was gorgeous. Dear wendy. Looks delicious, I love anything with fruit in it! This looks heavenly – looks just what I need with my breakfast! Gorgeous, gorgeous. Maple syrup-crazy I am at the ‘mo. I had everything in the pantry so just made it! Rising for another 5 hours and looking forward to the aroma from the oven…Wendy you must have great arm muscles, I was ‘phoofed’ after the kneading, perhaps the dough was too stiff and I may have needed more liquid on this cold autumn day. We will see. Thanks for this recipe – I was tempted indeed! Yes, I would definitely add more liquid this time to achieve a softer dough. I would say it depends on the flour. Out of the oven now and has not risen as much as your lovely photo Wendy, but a nice crunchy crust and have cut while still warm – delish!! Will try again soon. Although yours looks nice too. Nylondiner – I tried it with dried cranberries once and it was good. Imagine anything would work though. Aforkfullofspaghetti – Butter is essential, I agree! Heather – Hope you enjoy it! Siri – I’m not sure what else it can be used in other than milky drinks. It’s good stuff though! Dear Little Miss Moi – Thank you! Johanna – Oooh, nice idea! Bet that was lovely. Lucy – Seems a few of us are. I had some young guests for breakfast this morning and they had it on toast! Rosie – You are one spoilt wee dog if you’re getting Soreen! Shan’t let Marco read this. Tell your Dad and the gang to bring you up for a visit soon. Thanks for those wee hints Wendy, organic flour and mineral water may just be the answer, and I do wish for an airing cupboard again – the best for bread. We are toasting the bread this morning – not much left for the rest of the day….